Ever looked at photographs of your parents' or grandparents' wedding only to find they can't even remember the names of some of those present in the pictures? That's the problem with relying on memories - they tend to fade over time. Organising a wedding guestbook not only gives you a record of who was present on what's meant to be the biggest day of your life, it also allows your guests to add personal expressions of goodwill that they simply wouldn't be able to convey to you during the event. With a little bit of preparation, you'll end up with a fabulous memento of your wedding day. Here's how to go about it. Match your book to the size of your wedding. If you're only inviting 50 guests, a volume designed to accommodate the comments of 200 will end up looking sparse and unfinished. Likewise, it'd be a tragedy if you had to limit space just because your book was too small. As long as you buy a book with decent-sized pages (see below), one page per guest should be sufficient for your needs. Go for a book that's at least A5 size so you can fit comments in on the same page as photos. It'll make it easier to identify people later if you can match their words to their faces instantaneously. The best way to ensure guests don't just write their names and nothing else is to provide them with as much blank space as possible to get creative. Don't buy a book with lines, or worse, columns - it will make people feel there are limitations on how much they can add. Putting the guestbook on a table away from the action makes it easy for guests to forget about signing it. A good way to avoid this is to have the book passed around tables in between the end of dinner and the beginning of the speeches, so everyone gets a fair chance to add their sentiments. People don't tend to bring bulging handbags to weddings, so it's a fair bet that very few of your guests will turn up with a pen. Provide as many writing implements as you can on tables -by buying a job lot of glass containers and stuffing them with Biros, felt-tip pens, coloured pencils, silver and gold markers and anything that'll encourage people to pick up a pen and get stuck in. The difference between a well-written guestbook and one where everyone's simply signed their names is like the difference between a historical novel and official documents of the period - only one of the two really gives you an idea of what the atmosphere and people were really like. Make it clear to your guests that you want a bit more than just a signature and standard wishes of goodwill. 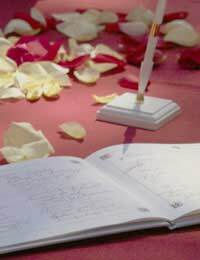 Great suggestions for your guestbook include favourite reminiscences, funny quotes or happenings from the day that you may have missed, pieces of advice for the newlyweds, drawings, appropriate poetry or even verse composed on the day.To help get people off the mark, ask your close relatives to write their good wishes in an appropriate style on the first few pages of the guestbook the day before the wedding. Guests can then follow their example without feeling too intimidated. The advent of digital cameras and portable printers means photos can be ready and added to your guestbook pages in seconds. Taking shots of each table's not really a job for a professional photographer, so ask someone who knows the guests reasonably well to go round and take digital shots. Print these off, stick them straight into the book and then pass it round so guests can add comments next to their photos. If you're planning to leave disposable cameras on the tables, ensure these are numbered by table so you can add shots from them to the guestbook later on. These cameras will capture more 'action' shots and impromptu moments than a designated photographer, which will add a different flavour to your pages. There's no need to stop at photographs either. Add tubes of children's glue to your containers of writing implements so guests can stick in pieces of confetti, wine labels or anything else that takes their fancy. Finally, if you feel your guests need a little bit of extra encouragement in the writing stakes, announce you'll award prizes to the writers of the best sentiments, be they hilarious, clever or touching. Read out the top three entries during the dancing - and don't forget to buy some extra bottles of champagne as rewards!